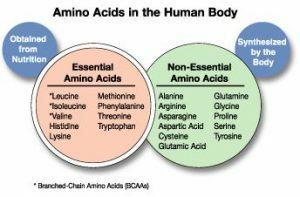 There are twenty kinds of amino acids that support the body, each having their own functions. There are as many as one hundred thousand kinds of proteins that constitute the body, and these comprise only twenty kinds of amino acids in various combinations. These twenty amino acids are essential to the body. In addition to being the materials for proteins, they are used as an energy source for the body when needed. In addition each amino acid plays an important and unique role in the body, as detailed below. All of these 3 amino acids are called branched chain amino acids (BCAAs). They perform the important functions of increasing proteins and serving as an energy source during exercise. BCAAs are amino acids present largely in myoproteins. An important amino acid as it is an energy source for the liver. One of the amino acids which most easily used as an energy source. Reported to improve alcohol metabolism. Used as a material for synthesis of glucose (blood sugar) needed by the body. Essential to the health of the liver. An amino acid needed to maintain normal functions of blood vessels and other organs. Plays an important role in expanding blood vessels to facilitate the blood flow. Nitric oxide, which is required to expand blood vessels, is made from arginine. An amino acid that is useful in eliminating excessive ammonia from the body. Reported to enhance immunological function. Arginine possesses various functions, which the body utilizes when necessary; like when blood flow is insufficient during exercise; or when ammonia, a fatigue-causing substance, is increased; or when body resistance is likely to decrease. An amino acid needed to maintain normal functions of the gastrointestinal tract and muscles. One of the amino acids contained most abundantly in the body. Plays a role in protecting the stomach and intestinal tract. Used as an energy source for the intestinal tract in particular. Reported to protect the liver and to increase alcohol metabolism. Glutamine is used as an energy source for the intestine and is an indispensable component to maintain its normal function. This amino acid is also used to enhance liver function. It is a representative essential amino acid. Tends to be insufficient when we are on a diet centered on bread or rice. Deficient in flour and polished rice. Flour lacks lysine the most, especially when compared to the ideal amino acid pattern. The deficient amino acid should be supplemented to enhance nutritional value. A project by the United Nations University has shown that lysine tends to be deficient in developing countries where people depend on flour as their protein source. If amino acids such as lysine are deficient it may lead to growth failure. Contained in asparagus in large amounts. An amino acid which is most easily used as an energy source. Maybe used as an ingredient of nutrient preparations. Aspartic acid is an amino acid which is located most closely to the TCA cycle, the site of energy production. The TCA cycle can be likened to the engine of a car. Based on this mechanism, each of our body cells generates energy. Glutamic acid is often referred to as Glutamate. Contained in wheat and soybean in large amounts. An important taste component of Japanese stock soup. It is contained in various natural foods. Reported to accelerate early recovery from fatigue during exercise. The main component of “collagen” which constitutes the skin and other tissues. Serves as a fast-acting energy source. Cysteine is easy to be deficient in the infants. Synthesized from methionine in the human body. With infants the ability of this cysteine synthesis activity is not sufficient. An essential amino acid which is used to form active sites of enzymes. An essential amino acid which is used to produce various substances needed by the body. An essential amino acid which is used to produce histamine and others. An essential amino acid which is used to produce various useful amines. Used to produce various useful amines and is sometimes called aromatic amino acid together with phenylalanine and tryptophan. It is an amino acid which is located close to the TCA cycle (place of energy generation) together with aspartic acid. Used to produce glutathione and porphyrin, a component of hemoglobin. Used to produce phospholipids and glyceric acid.